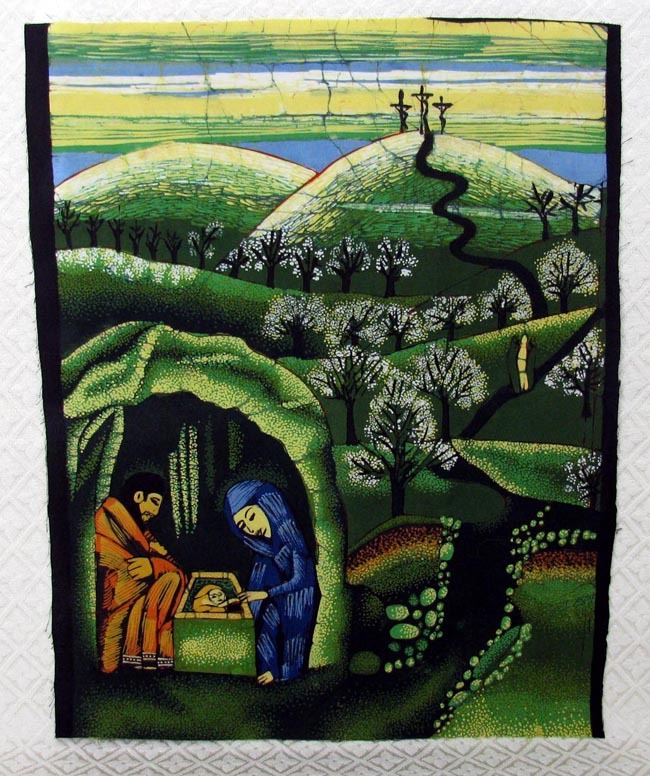 This batik cloth depicts the Holy Family where Jesus is born in a cave, connected to a path that ultimately leads to Jesus’ crucifixion on Golgatha in the distance. The path figuratively connects the beginning and end of Jesus’ mortal life. In the middle of the scene, Jesus is shown walking on the path toward Golgatha with two other people, perhaps symbolizing the two disciples on the road to Emmaus. The scene is based on a painting titled Kreuz und Krippe (Cross and Manger) found in the Maria Laach monastery in Germany, made by Beate Heinen in 1986. The batik was a gift from a client in the Netherlands. When he had the opportunity to visit Sri Lanka, he had two of these cloths commissioned especially for him by a small artisan shop. The cloth measures 16.5 inches tall by 12.5 inches wide. Batik style originated in Indonesia and means drawing by using wax. The artist begins with a white cloth upon which s/he prints a design. Wax is then applied to the areas that will remain white. The cloth is then bathed in the dyes beginning with the lightest to the darkest all the while applying a layer of wax to separate the colors. By the end of the process the cloth will be completely covered in wax. To remove the wax, the artist crumples the cloth and then uses an iron to remove the final remnants.